Katherine Applegate is a skilled children’s book author, as those who love The One and Only Ivan already know. She’s turned her talents now to an interesting subject: how the world looks from a child who’s parents are homeless. It’s a sorry state of affairs to admit this is as prevalent as it is. The most interesting part of this children’s book is that it allows us to see that perhaps homeless people are just the same as you and me, but having a very difficult financial time. It removes all the demonization that often occurs in our society about homelessness. I can’t say personally if this children’s book represents the way things are or not. But I can say that if it allows more compassion to arise in the rest of the population, especially children, then it is well worth reading. I suppose it’s a bit sad that our culture today has the need for bringing up a subject like homelessness in a children’s book. But as long as we live the way we do, we may as well address these issues skillfuly. A key point in this book is the question of telling the truth. When do we share the truth with our children? How does our effort to protect them from the difficult truths help or hurt them? Crenshaw examines this question, and more, as we watch Jackson struggle with the truth. This includes the truth about his imaginary friend as well. 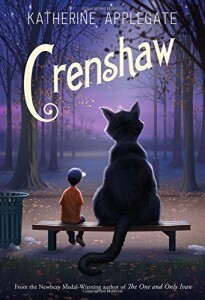 Excellent children’s book, dealing with all the things that a young boy may go through as well, giving up on imaginary friends, in need of something to hold on to, needing friends, and dealing with the shame of homelessness.